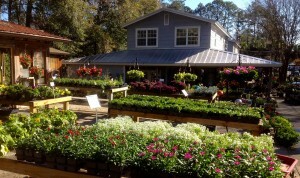 About | Garden Gate Nursery - Gainesville FL better selection. better advice. Garden Gate Nursery provides all outdoor gardening and landscaping plants available for USDA Hardiness Zones 7 through 10. Our garden center is divided into 9 sections, including: Annuals, Perennials, Natives, Bonsai, Houseplants, Roses, Vines Aquatics and Xeric plants. 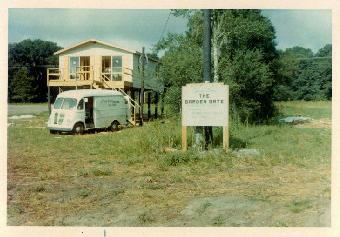 In 1961, Riley Blitch graduated from the University of Florida and opened San Felasco Nursery on some land on Millhopper road in Gainesville, Florida. Several years later, Tommy Feiber joined him and they began a landscaping business, Gainesville Landscape Contractors, which was incorporated in 1967. Adding to their growing business, Garden Gate Nursery was opened in January 1970 on new property on NW 43rd Street in Gainesville. At that time, it was considered “out in the country” and was surrounded by cornfields and a small country store on the corner of 43rd Street and 23rd Blvd. Today it is in the middle of an upscale shopping district with many local shops and restaurants. Since 1967, Garden Gate Nursery has been Gainesville’s and North Central Florida’s premier retail garden shop, botanical service center and gift shop. We specialize in all your gardening, horticultural, and floral needs. We provide various Fountains, Statuary and Pottery along with locally grown Trees, Shrubs, Annuals, Perennials and Houseplants as well as Fertilizers, Soils, Garden Related Gifts and Accessories. Garden Gate Nursery provides all outdoor gardening and landscaping plants available for USDA Hardiness Zones 7 through 10. Our garden center is divided into 9 sections, including: Annuals, Perennials, Natives, Bonsai, Houseplants, Roses, Vines, Aquatics and Xeric plants. Whether you’re an avid Master Gardener or part-time weekend novice, we have you covered with reasonable prices and unmatched customer service. Our knowledgeable team will be more than happy to offer information about plant placement, watering needs, nutrient requirements or any particular idiosyncrasies a particular plant may have. Impress your neighbors and friends by having the best garden and yard in the neighborhood.